On one hot summer day a few years ago, my husband and I were driving along the West Side Highway in New York City. There was this dinky corner garage with horses standing outside in the sun, looking exhausted, dehydrated and rundown. That’s when I realized that it was one of few city stables that held horses that pull carriages around the city, and that’s where they go when a hard day ends. It may seem all wonderful and romantic, especially when you see these carriages in Central Park, waiting for tourists to mount a ride around the city for a small expense. But this practice is outdated. Afterall, we have cars now, and it is no longer a necessity to subject such an animal to urban streets. Carriage horses endure loud noise, car fumes, traffic dodging, hard pavement pounding for most of their lives. The busyness and polluted environment of city streets are extremely stressful for horses. They haul heavy carriages all day, and it has been reported that they receive very little care and good nutrition. Over the past few years, a rising number of horse-and-car related accidents for both animals and humans. Horses could suffer respiratory ailments and even drop dead on the streets from heat strokes in the summer. At the end of of a hard day, they retire to sad little stables (more like garages)–and before they could recover, before the sun rises, another hard day begins again. When they get old and become useless to the business, they do not necessarily retire to green pastures, they get sent to the slaughterhouse. This practice is dangerous to both horses and humans. Accidents are waiting to happen, and if you are unlucky, you could be the victim of horses gone wild, taxis crashing into pedestrian walkways, etc. Please spread the word to your friends and family who are visiting cities planning on horse-drawn rides. Sign the petition today and let our government know that this is cruel. (The U.S. does not have any strict provisions in the protection of horses). Major cities like Paris, London, and even our own cities like Key West have already banned carriage rides. Let’s help make New York a more humane place to visit. This is a very serious issues – been getting so much press lately. I think even if the horses are treated ok it still seems carriage rides are so early last century. I often wonder if the horses get sick from all the car fumes on the streets, that can’t be good for their lungs! I live in a very rural area in the SE United States. One of the ‘quaint’ offerings in the area is horse-drawn carriage rides. I like to wear my PETA shirt proudly and comment on the issue as the carriages pass by. Whether we’re talking about eating, riding on horse-drawn carriages, wearing fur, or whatever, it seems that if people simply stop and *think* about what they are doing, they’d come to the conclusion so many of the rest of us have– PETA’s creed shows the compassionate way to live. I work for a horse carriage company and I promise you our horses are anything.. ANYTHING but abused. I’ve been around horses since before I could walk and my absolute adoration for these animals hasn’t declined as I grew up. I would not, absolutely would NOT work for a company which I thought was causing these horses any harm. We have a very old mare. Very, very old mare. No one likes working her but we -have- to. When the officially ‘retired’ her to be put to pasture and relax the rest of her life she got very weak, lethargic and thin. The Vet was called out, nothing was wrong with her, but they hinted at depression. This was two weeks after she’d been retired. They gave it a shot and put her to work on a short 2 hour shift at night when it’s coolest and she worked her little heart out. The pep was back in her step, her head was high and she was chuggin’ along like the little engine that could. When she came back to our barn after her shift she ate for the first time in quite a while. We’re happy to say she’s now working short shifts and she couldn’t be happier. The hard pavement and stress on their joints is alleviated by rubber between the shoe and the hoof to absorb some of the shock. The carriages, without wheels, are indeed quite heavy. Put the wheels on them and they roll like nothing else. Ours are kept in a warehouse and they are left to the HUMANS to pull out. I’m five foot two and all of 115 pounds. I can pull these carriages with one hand. They are built to be easy on the horse. The last thing we want to do is have them pull more weight. I had this concern when I went into my job and to prove a point, the manager put 6 co-workers in the carriage and had us pull it. Granted, I couldn’t do it alone, but two people can pull it a comfortable distance. Our horses are not kept in stalls all the time. They are rotated out in green fields with their cattle, mule and donkey friends to frolic and be happy horses. I have seen these horses eat.. a lot. Their food is top-of-the-line, appropriate for work horses and their diet changes for what suits them best in the summer and winter. They are never without food. We bring 20 gallons of water (PER HORSE) out each day for the horses to drink. The minute we run out, we go back to the barn and refill. Loud noises are unavoidable, but claiming that it causes them stress is a bit ridiculous. They are as used to it as we are. We don’t flinch when someone slams a door, or a speaker is blaring, or a fire engine whizzing by; neither do our horses. It’s as common place for them as it is for us. It’s visible when a horse is worried about something in front of them and loud noises aren’t one of them. If they’re scared by simple noises, then they’re not a good carriage horse. Then it does stress them out and they certainly don’t need to be working the streets because accidents will happen when you put a high-strung horse on the roads. The horses only work 3-4 days a week and most of the respiratory ailments are actually not caused by fumes from vehicles. I’ve been working there quite sometime, and even our very, very old mare has yet to be in anything but perfect condition. I know, unfortunately, that all carriage services do -not- provide their horses, their friends, and their livelihood the proper care, treatment and respect that their horses deserve. But please (I’m talkin’ to you, Englishrain) don’t be an idiot and jump down our throats for mistreating our horses. I’m sure there are companies out there, but I know for a fact most carriage companies (even our competition) loves their horses like they should be loved. People often forget that there are certain breeds of horses that were made to work. Working makes them happy. Working keeps them sane. The same goes for dogs. If you don’t go out and exercise your border collie, chances are you’re going to have a neurotic dog on your hands because they’re bored. Everyone that claims that we abuse our horses seem to be a ‘horse’ expert when the closest they’ve ever gotten to a horse is looking at one of ours. We know our horses better than you do, we promise. We know each and every quirk of each and every horse. We know what they like, what they don’t like. How much they’re going to drink on any given day, or if they don’t drink at all while they’re working (then their days are very, very short). But really, most of us are quite nice. Come up and talk to us about our horses, we’ll talk your ear off about them! They’re like our children, we want to brag about them, we want to show you how proud we are of them, we want to show you pictures of them being silly that we’ve taken on our phones, or how muddy they got from playing in the pond at our pasture. Come up and pet our horses (but not in the face, please). They like a good neck scratch, and they may even make a funny face to let you know it feels good! Scratch under their forelock and they may use you as your own scratching post! Come run your hands over their body, inspect them and see that they have never known the sting of a whip or the grumbling of a hungry belly. Feel how soft they are, they love all the attention. It lets them know they’re doing a good job while we’re sitting up on the box and unable to get down. We’re not all bad, I promise. This is very informative, and I’m sure there are people out there that loves and cares for their horses the way you do, and I do believe that not all horse carriage businesses are bad. However, despite of this, it still seems wrong to make horses work daily in cities as polluted and stressful as NYC. They might enjoy pulling as they are work animals, but maybe in a park and quiet area of the city, not down fifth avenue with buses, swirvling taxis, bicycles and people. We’ve all seen the accidents, and though you might compare that to plain bad luck like lightning strikes, at least this can be avoided. I’ve been in and around the carriage business for about three decades. Your description of your company’s practices sounds much closer to the norm than the article does. I’d still like to know what the author thinks equine dehydration looks like! Some people have so much passion about a thing they believe, that they invent and exaggerate details to support their beliefs and they refuse to open their minds to real facts as known and shared by those involved. Keep speaking truth and loving those horses! Yeah…I LOVE manual labor in extreme weather also….Seriously? Let me guess you go home to a nice big pork chop dinner afterwards also. IGNORANCE!!!!!!!!!!!!!!!!!!!!!!!!!!!!!!!! If you have something intelligent to say, please do so. Please do not go on people’s blog and judge their content if you do not have something to back up your statement. Thank you. nope, i wait until the horses are settled, rugged and happy then do my own horses and no i’m not a meat eater. i usually have tea at around ten and then settle down, the horses are extreamly well treated and spoilt on jobs and always will be as they look after us while providing an income and we look after them until there last breath like we had one pass away last year who was 28/29 years old!, the horses love humans and there work i can not stress this enough. i love my work even though i have lung disease and get really ill in the winter this doesn’t mean i’m miss treated but don’t want to waste my life away doing nothing and neither do these animals, they wait at the gate to go to work. if our horses didn’t enjoy there work believe me they’d show us. one of our horses was abused in hungry when we had him he was frightened of you and would’t touch you….. now he gets bathed kisses and gives kisses he also nuzzels me often he loves his work too and is very very good at it, if we were making him suffer why would he be interacting with us when he didn’t with his previous owners. i’m not saying all people treat them the same but THEY SHOULD NOT BE BANNED however if there is need for consern then the animal wellfare society’s should be involved and f the animals are coming to harm then as always they should be advised how to treat them correctly or banned from keeping them. I’m another horse lover, trainer, owner, and driver. My own horses come up to me in the pasture to see what adventures we’ll have today. I put a simple halter on her head. (for those of you out there making the most fuss and who know the least about this, I’ll explain that a halter is a lightweight set of straps that fits loosely on the horse’s head and allows us to direct them. No metal parts, no sharp points, nothing that could cause pain or injury.) I groom her, and she tells me where her itchy places are by making those funny faces when I groom them. I sit on a bucket under her and rest her foot in my lap to trim her hooves – think thick fingernails, it’s the same thing. I lead her up to any large stable item that will work for a mounting block, and she steps sideways to present herself for me to mount up. I didn’t teach her this, she figured out that it’s the quickest, easiest way for us to get started having fun on our ride. I ride with the same halter – no bit in her mouth. She willingly complies with my direction because we have that kind of relationship. Although I don’t have the same personal relationship with my carriage-pulling working partners, I care for them as tenderly as I do my own horses. Clem would gallumph his big Belgian Draft pony-platter-paws up to greet me when I went to take him to work. He knew we were going to work, that’s the only time I went there. He stood happily while I groomed him, reached to show me the itchy spots, and rolled his eyes back and bobbled his head when it got really good to him. Then I got the harness and started putting it on him, and he stood there patiently – still with nothing on his head to hold him in place! He could have walked away at any time if he wanted to. I put his bridle on last, after I had harnessed his partner, Frank. Frank had been a Standardbred race horse and had a somewhat lower opinion of humans than Clem had, but he certainly didn’t resist being caught or harnessed or working. To the author of this article: Do you know what a relaxed horse looks like, to compare it to one that is “exhausted, dehydrated, and run-down?” If you go past a pasture full of horses that have knee-deep grass, a clean, fresh creek, and nothing to do but enjoy it, you’ll see about half of them standing around much like the one outside the dinky garage. They haul carriages, yes, but what is heavy to you or I is a piece of cake to a 1,550-2200 pound horse. “It has been reported” that they receive little care – reported by whom? Others with as little knowledge of horses in general and carriage business in particular as you? “Horses could suffer respiratory ailments and even drop dead on the streets from heat strokes in the summer.” Sure, it *could* happen – but you offer no evidence that it *does* happen. “At the end of of a hard day, they retire to sad little stables (more like garages)–and before they could recover, before the sun rises, another hard day begins again.” How do you know this? Have you watched the horses go in at night and come back out before sunrise? The carriage companies I’ve worked for do very little business in the daytime, mostly only during Christmastime. I have serious doubts that they’re getting any business during rush hour, and very little before 2PM, even in the most touristy cities. “When they get old and become useless to the business, they do not necessarily retire to green pastures, they get sent to the slaughterhouse.” Again, how do you know this? Are you in the room when the owner calls the knacker? You probably think that those in-city garages are the only places the owners keep their horses. Highly unlikely! More probably, they are like the companies that I’ve worked for, which keep their horses on farms outside of town and just rotate the working crew in for their week’s work, then swap out for the ones who have been resting up and hanging out in the pastures back at the farm. I guess when a person is so out of touch with reality, they get their satisfaction from stirring up others who are also out of touch with lots of unsupported rhetoric. Thanks for your thoughtful reply – but no need for insults. This is a personal blog on animal welfare – i do not proclaim to be an activist, however, I report what I read and the conclusions I draw from them, via new sources, animal welfare organizations. Living in NYC, I have witnessed upset horses in Central Park, in some cases where I saw the driver/owners yell or yank at the horses. I have seen the mouths of horses parched and some that looks sickly. I am not stating that all horses in this business are treated this way, just the ones I’ve seen on the streets on NYC, where I have lived for decades. I have seen them parked along the garages in over 100 degrees of heat, lined up and ready to go in the hustling and bustling, stressful city traffic. True, you may be a horse lover, trainer, owner and driver, and you may be among the good-hearted ones that treat your animals with care and compassion. True, I do not know that much about horses, though my uncle-in-law owns two precious ones who lives at his ranch in the mountainside of Colorado. True, I have not met the knacker or have interviewed drivers of NYC to get the full story. BUT, any person IN TOUCH WITH REALITY, can argue that horses do not belong in the city, as in the olden days where there were much less automobiles, bikers, tourist, pollution, sudden noises and events that could upset them. Hence, the horrible horse-drawn carriage accidents, sometimes, fatal. These accidents are facts. It does not surprise me one bit that people who responds so negatively and sometimes condescendingly to this post are all horse drivers who proclaim to know for a fact that everyone in this profession cares deeply about their horses. This simply cannot be the probability. I have no prejudice against horse owners and drivers, I just have issues with where and the conditions under which horses have to “work” – yes it is the livelihood for drivers and owners, but still, this is at the expense of horses’ wellbeing. They deserve to be roaming in better pastures, live in the wild, on ranches, and be ridden by people who TRULY appreciate horses in their natural surroundings. NOT New York City. I’m sorry, but putting all carriage owners/drivers in one basket is rediculous, just as there are good and bad in any business, there are good and bad here. Perhaps the best way to help here is not by boycotting the industry or getting them banned, perhaps encourage people to research their options and make a booking rather than just wandering up to any old carriage, or maybe researching them yourself and presenting a top ten companies or the like. I’m an animal cruelty crusader, especially where horses are concerned (PMU, Soring, culling, slaughter transport etc) and I’ve found that jumping around naming and shaming a whole industry without having all of the facts is a recipe for failure, you’re more likely to be blatantly ignored and attacked by the better half of the industry, who you should be partnering with to get rid of the cruelty tarnishing them, because odds are there are some great horsepeople amoung them, and that underneath all the controversy is something people really love. I’m more of a horse rider, and have only driven a few times, and loved it! Good on you to all of the above commenters who love and treat their horses well.. and a prosperous future to all of you and your amazing horses! JNG, if you want to write a meaningful, persuasive blog post about horse-drawn carriages *in NYC*, then title it “Carriages in NYC”! You titled this article The Cruelty of Horse Drawn Carriages – as if the whole industry is the problem. It does not surprise me one bit that people who write so negatively and sometimes condescendingly about this subject are all uninformed people who proclaim to know for a fact that everyone in this profession abuses their horses. This simply cannot be the probability. Does the paragraph above sound familiar? I just changed a few words from your paragraph. How about a bit of balance and fairness and research before condemning an entire industry, based on similarly unbalanced and poorly researched articles you’ve read from other PETA types. Maybe you think that if the misinformation is rehashed and regurgitated enough, it will become truth – or maybe that isn’t important? Maybe it’s the idea of bullying other people into living according to YOUR beliefs that appeals to you? I never said that every carriage company is kind to their horses, but you claim that I did – there’s another bit of misinformation you’re putting out there! I’ve never personally seen mistreatment of carriage horses, and if I did, I’d be on the front lines of putting the SOB in jail or at least forcing him out of the business. The way to get rid of the bad ones is not to attack the entire industry, or spread lies about it! I didn’t see your reply to my post until today, after another sensible, knowledgeable horse person made a post refuting your blanket condemnation of the industry. B. Some of the WORST treatment of horses that I’ve seen was committed by cowboys! Most cowboys still think of their horses as equipment necessary to the job (or more often the recreational pastime), and they spend most of their horse time surrounded by other cowboys with similar mindsets. Carriage people are aware that their image in the eyes of the public is vital to the survival of their business. 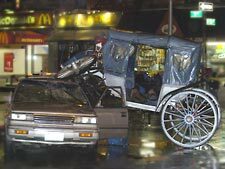 You don’t see carriage horses with blood coming from their mouths, or wearing wire or chain tie-downs, or trussed up in uncomfortable postures (as least not since the days of Black Beauty, which WAS a work of fiction, although based on the worst realities of that time). Invest some time and energy in learning bout these incredible creatures. You just might get bitten by the horse bug yourself! Before you laud an article, you might do a bit of research on the misinformation that is presented as fact in that article. Please read my earlier comments to gain a more realistic understanding of the carriage business as it really is. My horse training specialty is physically and mentally rehabilitating animals that have been mistreated and learned to fear and hate people. I currently have 6 equine students who now come to me in the pasture, when before they would run from or attempt to kick anyone who approached them. I work with their mind and spirit, using softness and kindness. I would NEVER condone or participate in any manner of ill-treatment of a horse or other animal.